As some of you have already seen, I’ve been working on a revamped version of Shodan. It already has some cool new enhancements over the current shodanhq.com website, such as support for CSV and JSON exports, prettier search listing, faster results, better integration with Shodan Exploits/ Maps and a lot of small tweaks to make life easier. You should be able to get a basic feel for the devices in the search results just from looking at the report. And if you’re interested in the details, you can perform a live search to get a listing of actual results. Reports are meant to be accessible! The old shodanhq.com website has bookmarks (there’s a small star icon at the top of the search results) but it was rarely used and didn’t offer much that browser bookmarks didn’t. 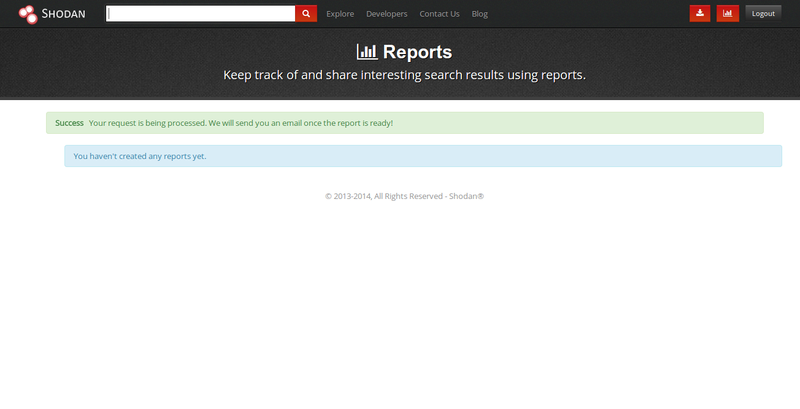 I’m hoping that these reports will provide a prettier bookmarking mechanism that’s also more useful! Alright, you’re sold on reports and want to give it a shot yourself – here is how. I created it because I needed a friendlier way to share search results and I got tired of manually generating my charts for blog posts 🙂 It’s very simple and straight-forward to create reports so give it a try and let me know what you think! And that’s just the tip of the iceberg, there is a lot of other protocol-specific data gathered for each service. But making all of that information available through the web interface can be a bit tricky and takes time to get right. Instead of sitting on that information though, I decided to make all of the data available through a new and improved Shodan API. Note that a new web interface is being developed to expose all the cool new data, but if you don’t want to wait you can get your hands on it right now with the API. Along with access to more detailed data, the new Shodan REST API also provides greater flexibility so you can get a top listing of the stuff you care about. For example, the old API would always return the top 5 countries and cities for your search query. What if you didn’t want those? What if you’d prefer to get a breakdown of the top organizations? Or the uptime distribution? Or you don’t care about the actual results and only want the top 100 cities that match a search query? All of those things are now possible with the new API. And if all you want are the actual results, then searching the new API will be much faster than before. Each of them provides increased levels of access, from 1 million results/ month for Freelancer up to completely unlimited access to the REST API at the Enterprise plan. The pop-up for the Shodan plugin is as simple as possible, which also means it doesn’t show the full banners for every port. There wasn’t enough room to fit everything in, especially for some of the hosts that have tons of ports open. I’m looking to find a way to show all of that information and more in future releases! For now, I’m happy to finally have a way to quickly see who’s hosting a website (the hostname often gives that away) and if they’re running some unusual services publicly. Oh, and if you see a dark blue square that means it can be opened by your browser and will open up a new tab with the IP:port if you click on it (in case you want to see what it shows when you access the webserver via its IP instead of hostname). Go download the plugin and let me know what you think! All of these protocols have been deprecated due to security issues or superseded by better alternatives. Even though they’re probably not in the active minds of the modern sysadmin, these protocols are still alive on the Internet! 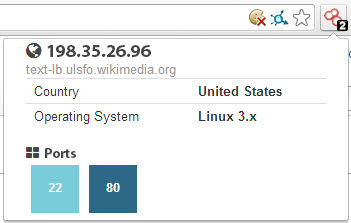 Note that the majority of the results don’t appear to actually be results of systat. Instead, it looks like the port has been re-purposed by a few people to run FTP, SSH and HTTP servers. This will also be true for netstat, where a lot of the results are from popular protocols running on a non-standard port. A simple protocol that returns the current date and time for the server. Shows all the currently active network connections on the device. There will be separate blog posts to look at the details of who’s still running these ancient services, but the data’s already been gathered and is searchable on Shodan. So please check to make sure your organization isn’t inadvertently using any of these protocols! I’ll be keeping track of these services over the coming months to determine whether these protocols are becoming more or less active and by how much. The above is a map of the globally exposed routers that contain a backdoor, and the way I’ve generated those images has until now been an internal tool. 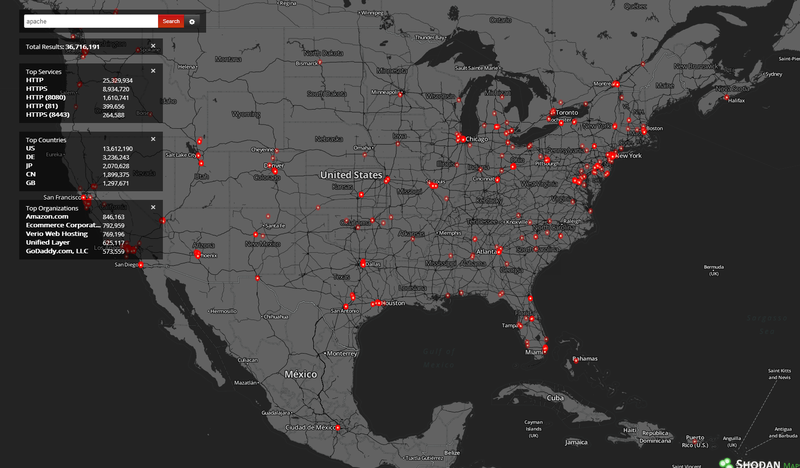 After making some changes to increase performance and make it more user-friendly, I’m officially releasing a new way to browse the Shodan search engine in the form of an add-on: Shodan Maps. 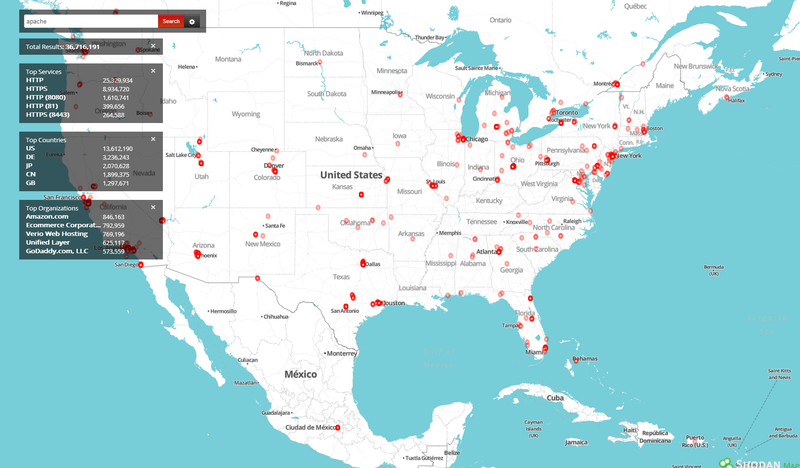 Shodan Maps provides a new and easy way to search for devices on the Internet and see the results on a map instead of a regular search listing. As you zoom into an area, it will narrow down your search results to only show devices that are within the viewable area. It essentially works and behaves the same way as every other map search service (Google Maps, Bing Maps etc.). 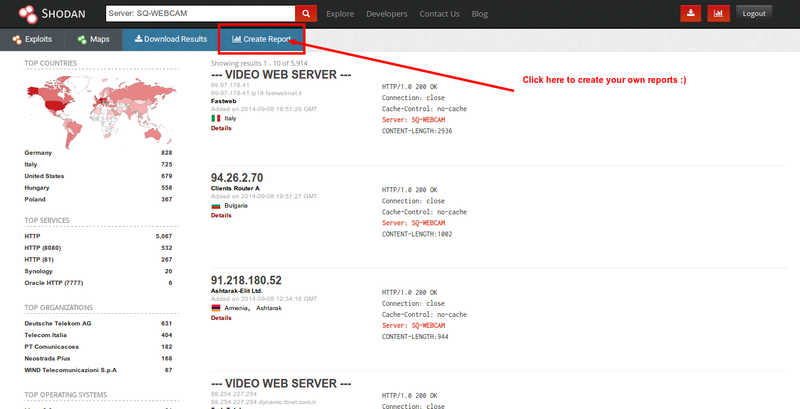 It will currently display up to 1,000 results at a time on-screen as well as summary information about all the results (location-independent) such as top 5 services, organizations and countries. Note that it can take up to 30+ seconds sometimes to complete a search, depending on how far zoomed out you are and how many results there are in total. The map style can be changed anytime using the settings button next to the big read Search button. And when you click on one of the red dots you will see more information about the device, such as which services it’s running, who owns the IP space and anything else that is useful to know. I’ve found it very insightful to put results on a map and figure out patterns in the data, hopefully Shodan Maps can do the same for you! 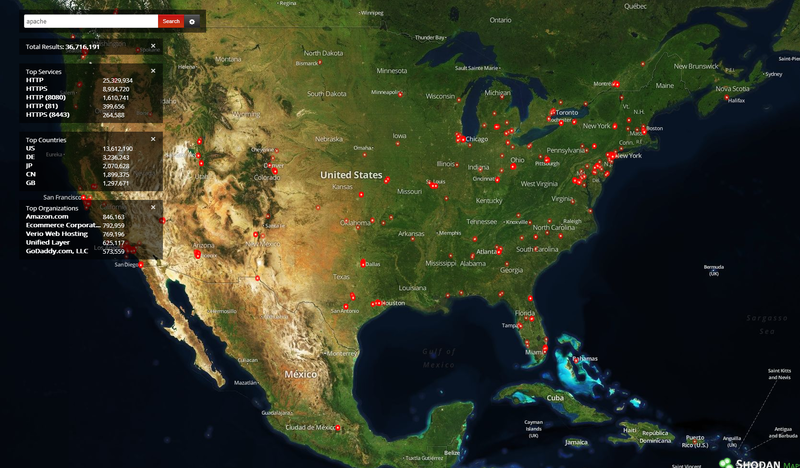 Shodan Maps can be unlocked for a one-time payment of $19! No subscriptions, extra fees or anything like that and if you don’t love it let me know for a full refund. NTP has been an interesting protocol for a while, I remember first hearing about the reflection attack 4 years ago when HD Moore unveiled some very clever research in how the “monlist” command could be used for various purposes. The gist is that a small packet can cause the NTP service to return a potentially large list of IPs, using the “monlist” command, that it has recently interacted with. And it looks like the protocol has made waves again recently when people started to actually use the “monlist” command in a reflection attack, effectively creating a DDoS. It’s interesting that it’s taken nearly 4 years to take it from HD Moore’s original research to publicly aware DDoS method. Have the attackers not needed a new method until recently, did their tools lag or have people simply not detected that this has been going on for a while? I’m not sure what the answer is and I’d be interested to hear whether others know more about this. 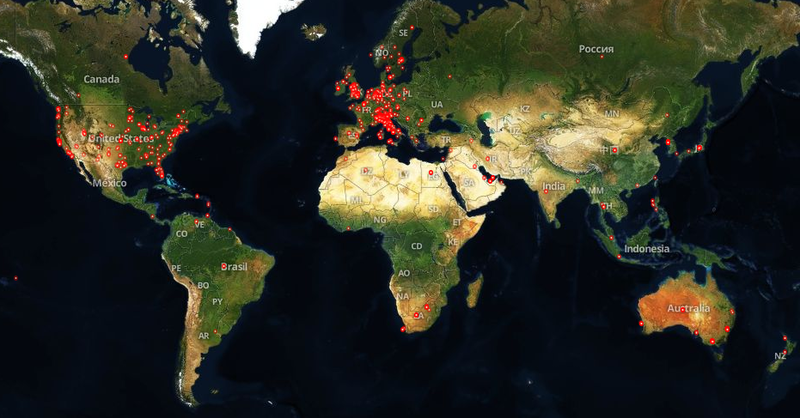 To learn more about NTP and how widely deployed it is across the Internet, I’ve added the NTP service to the list of ports that Shodan surveys. 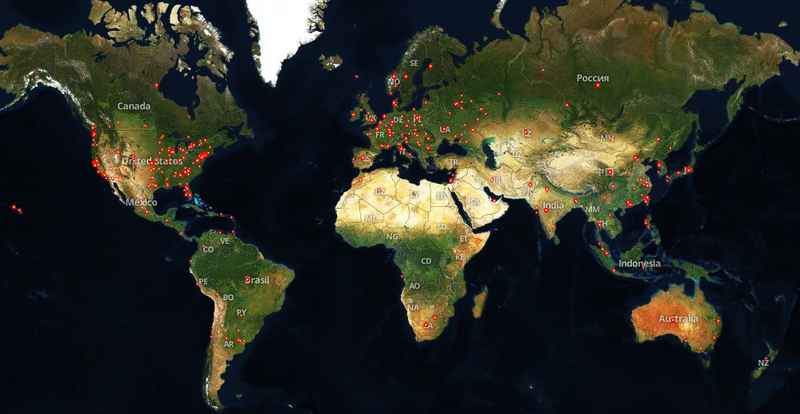 So far, Shodan has identified more than 1 million devices that are running NTP on the Internet. And along with adding the service, I’m also making available a variety of new filters and facets. These are currently only accessible via the Shodan API (and any tools using the new API), but the filters will be rolled out to the main website very soon. Search the initial list of IPs that the monlist command returned. The number of IPs that the initial monlist command returned. The ports that the listed IPs used to connect to the NTP server. true or false – Whether or not there was more data to be read (i.e. more than the initial list of values). It’s interesting that South Korea has a disproportionate amount of NTP servers, but otherwise I’d say the numbers and global distribution look fine. 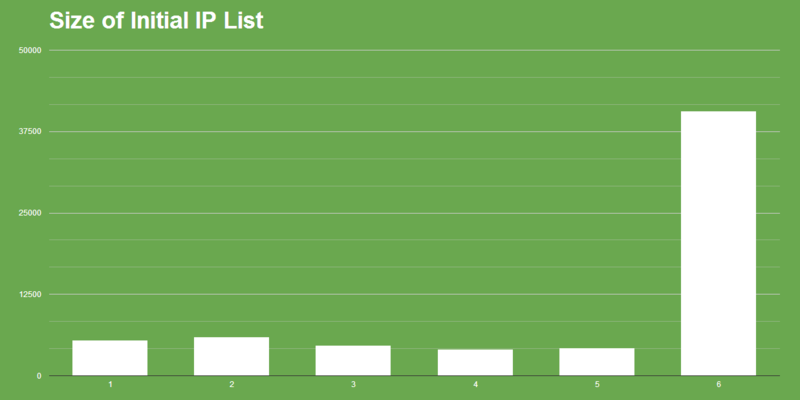 An interesting side-effect of the “monlist” command is that doing the survey on the entire Internet reveals patterns within the IP lists themselves. For example, faceting on ntp.ip reveals that there are a few standout IPs that get returned by a lot of NTP servers. 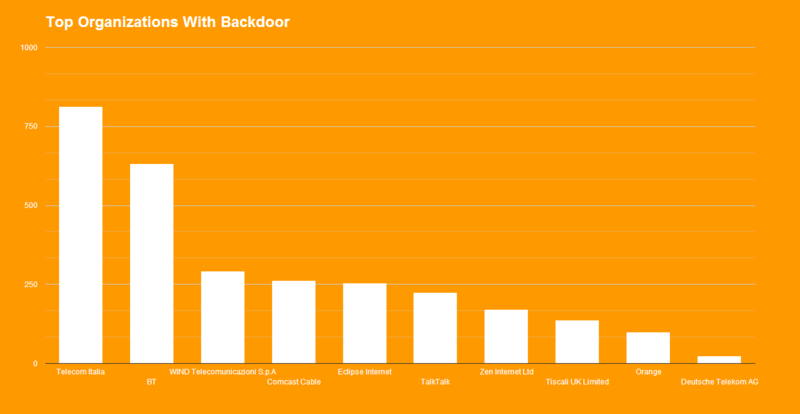 These top IPs are most likely scanning the Internet for NTP. 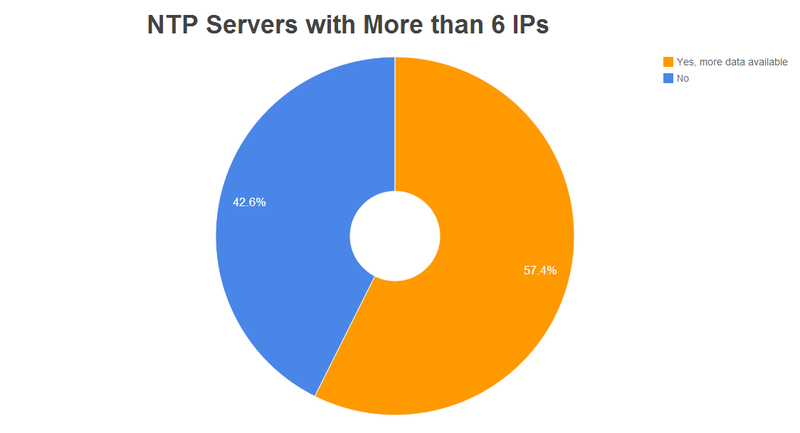 The majority of the top IPs have websites setup that indicate they’re doing research on the NTP DDoS reflection/ amplification attack, but the #1 IP that is crawling for NTP servers is from China and doesn’t have any research website available or indicative hostname. The IP is “58.215.177.51” and historically it had an HTTP and FTP server running on it, though they aren’t available anymore (perhaps dynamic IP range). If anybody finds out more about that IP and whether or not it’s another research project, please let me know. Note that for these charts NTP servers that returned errors weren’t included. If the servers with errors were included, then there would be ~13.5% with more data. I.e. out of all NTP servers on the Internet, including ones that didn’t respond properly to the “monlist” command for various reasons, ~13.5% of the devices returned more than 6 IP addresses. 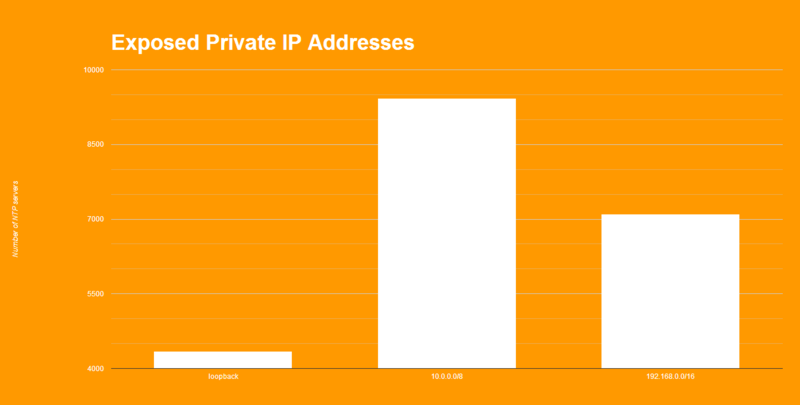 At the time of writing, there are nearly 10,000 NTP servers that list a private IP on the 10.0.0.0/8 netblock in their response, and another ~7,000 devices that list an address in the 192.168.0.0/16 IP range. Of note is also that a few devices (4,345) even include their loopback IP in the response. All the data is readily searchable via Shodan, so if you want to keep track of these stats and more just grab a free API key to get started. There’s also an updated Python library that exposes all of the facets, including the new NTP-related ones (stay tuned for more info on the API). There’s a lot more cool stuff that can be done with NTP and it’ll be exciting to see what further research into this area discovers! As soon as the backdoor information was posted on github I got curious about how common the issue would be, so I added port 32764 to the list of ports that I survey. I had set it up and moved on to work on other things, but the topic came up again recently so I thought I’d take a quick look at the data and see what can be learned. A lot of devices respond on port 32764, but the majority of them are going to be firewalls, random web servers or other shenanigans that have nothing to do with the backdoor. To only get results that mattered, I searched not just for port 32764 but also for the strings “scmm” and “mmcs” (the same value just w/ different endianness). At the time of writing there are 6,401 devices in Shodan that match the criteria for routers with the potential backdoor vulnerability. It’s interesting that the US doesn’t lead the number of public devices, since in general it’s at the top for online devices. Instead, we see that Great Britain leads the charge with 2,228 devices followed by Italy with 1315. Both of those are a bit surprising and probably indicate a bias in the routers that are purchased/ sold in those regions (more on that later). I don’t know whether this is a general product bias in Italy or whether Telecom Italia prefers those brands of routers, but Netgear DG834G appears the most popular router in Italy that also has a built-in backdoor. Similar breakdowns can be done for the other countries using a modified version of the above script, which I might do later on (mostly for Great Britain). 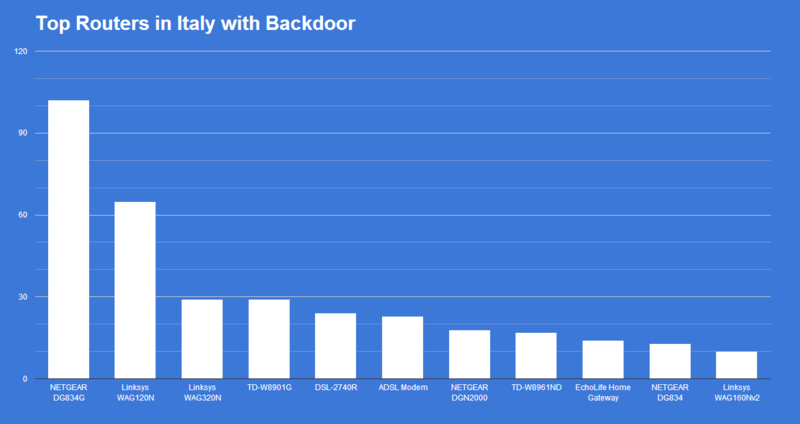 Compared to routers that advertise their default credentials (62,883) or old Microsoft IIS servers (5.0 is at 312,334), the total number of routers with a publicly exposed backdoor is very small (6,401). It will be interesting to see whether the service is exposed on other devices in different ways or whether this is the complete picture for the vulnerability’s risk to the Internet. Either way, this is how the data presents the situation at the moment and as things change I will update the information/ charts!